Please identify yourself as a firefighter so she can quote you the best price. 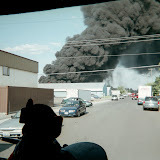 On January 20th, 2008 at 12:16 A.M. the Spokane Fire Department responded 3 engine companies, 2 ladder companies, 1 pumper ladder company, 1 rescue company and 2 battalion chiefs to a house fire located at 3110 N. Alberta. As crews were enroute to this incident, it was reported that there may have been an explosion and that a child may still be inside the home. When firefighters arrived, the entire back half of the house and an attached storage shed were fully engulfed in flames. A search and rescue team was set up and coordinated with a fire attack team as well as rooftop ventilation and it was soon confirmed that all occupants were safe and accounted for on the outside of the home. The fire was successfully knocked down and contained within 30 minutes and through firefighting efforts, crews were able to prevent the fire from consuming the front half of the home. As soon as the fire was contained, the long and arduous task of overhaul began and continued until 4:00 A.M. This involved pulling ceilings and removing burned items including structural members of the home. All of the occupants will be staying with friends and the Red Cross was notified for any other assistance that they may need. A total of 24 firefighters responded and fought this blaze. The cause is currently under investigation by the Spokane Fire Department Special Investigation Unit and has been undetermined at this time. There were no injuries to firefighters or civilians on this incident. Undetermined. Under investigation by the Special Investigation Unit of the Spokane Fire Department. Heavy fire Damage to the exterior and upper level of the home including the roof. Smoke damage throughout the home.